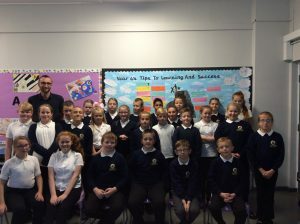 We are Year 6 and our teachers are Mr Pearson, Mr Hyland and Mrs Brahme. We are really looking forward to the exciting year ahead. In English we will be studying historical narratives and speech writing and in maths we will be focusing on improving our arithmetic skills. In October we are going to visit Ingleborough – we can’t wait! I have worked at Holybrook for the past three and a half years and I have loved everyminute of it. Within the school, I have had the chance to work in a variety of different settings and classrooms: it is amazing to see everyone working together to achieve the same end goal – improving a child’s life. I feel proud and privileged that I have had the opportunity to inspire children and made a positive impact on their learning. Knowing that I have enabled a child to exceed in their learning makes the job satisfaction outstanding. Working at Holybrook is incredibly exciting and rewarding; no two days are the same. I have worked with a range of pupils from Reception to Year 6 helping them to learn and grow throughout their time with us.